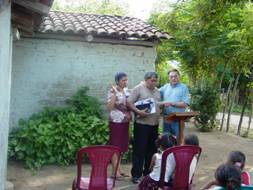 Pastor Saul and Zulema received the check for construction of the Baptist church in Zapotillo. 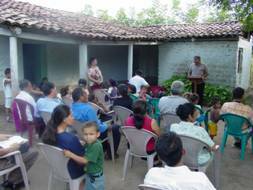 The Lord has graciously provided the funds to build two mission churches in Zapotillo and Danli. “I thank my God in all my remembrance of you, always offering prayer with joy in my every prayer for you all, in view of your participation in the gospel from the first day until now. For I am confident of this very thing, that He who began a good work in you will perfect it until the day of Christ Jesus” (Philippians 1:3-6). Open air worship service at the Baptist Mission in Zapotillo. Because of high inflation in Honduras, another church has pledged another $5,000 for each church to insure that we have enough funds. A third church with church construction experience in Guatemala is making plans to put metal roofs on these mission churches in Honduras. The Lord has provided the funds. Now we need two construction teams to begin laying cinder blocks January 1, 2008. In September 2007 Will taught classes to pastors and church leaders on the Spiritual Life of the Pastor and the Gospel of John. Pastors came from both the Pacific coast and the north coast to study together. This gave country pastors an opportunity to ask questions and look for practical solutions to problems they face in their churches. Some of the students in the Seminary Extension class in Danli, Honduras. Also on this same trip, forty-six pastors and twenty church leaders came together from neighboring towns to Ocotal, Nicaragua, to attend a three- day evangelism workshop. Students study for an hour and then divide up into groups of three and practice witnessing to one another in a secure Christian environment and then go share Christ in the neighborhood for an hour. People visited during the day are invited to the evening evangelistic services in the church. 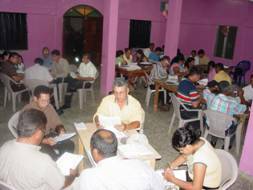 Pastors putting into practice what they have learned at the Evangelism Conference in Ocotal, Nicaragua. The goal is to equip and motivate pastors and church members to be effective witnesses. Pastors are encouraged to go back to their churches and teach this course. We also provide tracts with simple diagrams that help present the gospel. We use salvation bracelets and the wordless book to get the attention of individuals and focus their attention on the plan of salvation. We have been privileged to see people coming to know Christ as their Savior as a result of each of these evangelism conferences. 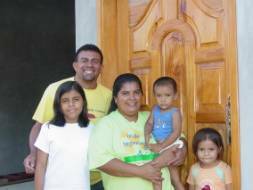 Pray for open doors in other parts of Honduras and Nicaragua.